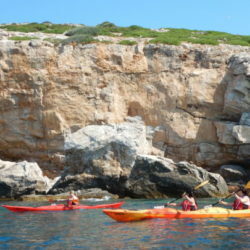 This kayak Athens day tour will take you to the most renowned and interesting area of the Athens Riviera, around the Kavouri (which means”crab”) peninsula, some 20 kms South of the Athens city centre. You will be comfortably picked-up at 8.30 am and our tour leader will briefly explain the day’s program and provide you with some practical info. You will then head South and arrive at a beach in the Kavouri area. There you will meet our local kayak instructor. 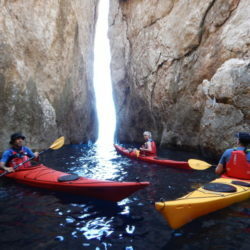 After a short briefing, if novel to this sport, you will be all set to your sea adventure. 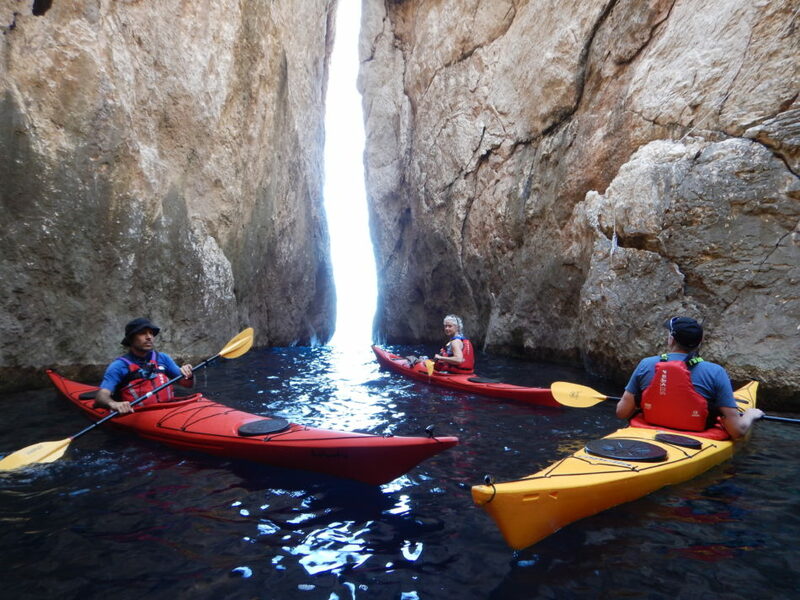 Depending on the weather conditions and your skill, you will get to see nearby islets and sea caves where to take pics and swim if you want to, ending in one of the many beaches of Kavouri peninsula, after approx. 2/ 3 hours of paddling. 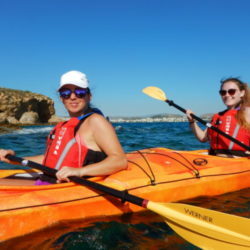 The kayak sea tour itinerary and length will depend on the group’s skills and preference and it is, therefore, tentative, as safety comes first. At the beach there will be some time to rest or swim. 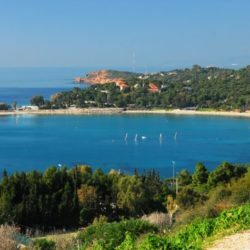 Once back on the shore, you will get prepared to set off to Vouliagmenis Lake, possibly the area’s main attraction. The lake is an impressive natural phenomenon created most probably by the collapse of a limestone cave due to an earthquake some 500 years ago. 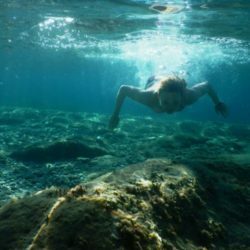 There you will have the chance to swim in its thermal brackish and lukewarm waters, the perfect relaxation treatment after 3 hours of intensive kayaking. 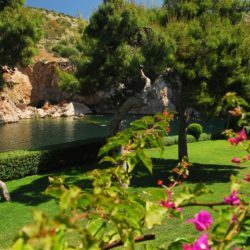 You can also opt for an extra 30′ relaxing massage (30 €) in a massage boutique that can help you recover from the effort before heading to the nearby Vouliagmenis Lake. If hungry, the bar-restaurant offers great dishes of Greek Mediterranean food (your choice, not included). In the afternoon you will be dropped off at your place. The route/ itinerary can change without prior notice according to the weather and wind conditions, safety comes first. Our tour leaders speak many different languages. Please provide a pick-up address. Extra health and accident personal is available upon request. You should have with you swimwear, hat and suncream. If interested in the massage session kindly advise in advance. Please provide your weight and height to adjust your gear and equipment accordingly. If you have any health issues please inform us beforehand. We may need to postpone or cancel the tour due to poor weather conditions, in this latter case we will refund the whole amount. In case of unexpected and extremely bad weather during the day and once the tour has started we will suggest an alternate tour/activity. If you do not agree we will refund you a 30% of the paid amount. Single individuals are welcome to book the tour as well. If by the date of the tour minimum participation requirement is not met, a new date will be suggested or the client is free to cancel with full refund of the paid amount applying. If more people sign in for this tour on the specific date, partial refund may apply if the corresponding rate for shared group tour is lower than the paid amount at the time of booking. 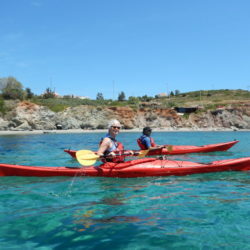 INCLUDED: Private car/ van transfers, a tour leader, a 3-hour sea kayak excursion with instructor, gear and equipment, a snack and water, admission to Vouliagmenis’ Lake. NOT INCLUDED: anything not specified, personal expenses, souvenirs, tips. Available at the same Price!